Front row: Leslie Auchterlonie, Linda Auchterlonie, Sheila Mackinnon, Margaret Ross, Norah Galloway, Margaret MacLean, Joan MacLean, Gwen Williams. This must have been our last photo before moving on to the Secondary School (and long trousers). Mary Campbell and Norah Galloway were my "girlfriends"...where are they now? 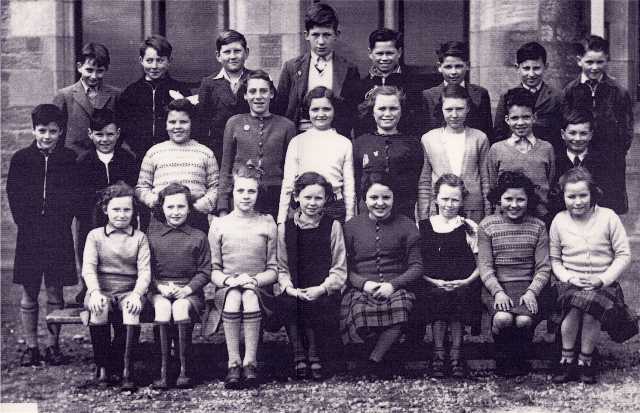 Are there any stories about Margaret MacLean (front row)? Margaret Maclean and Anne James would secretly call each other "twins" because we were both born on the same date, 25th October 1942. Hello Billy, have just found this site - very nostalgic. Re Norah Galloway, sorry to say she passed away some years ago. I have not been home to Inverg since 1979 so it has been fantastic to see so many faces that have jogged my memory. Hello Jane, Thanks for the (rather sad) news about Norah. I guess out of a group of 20/30 kids there is always going to be some that don't make it to a reasoable old age. I love the Invergordon Site, it is quite the best thing I have ever found on the web. Having left home at 15 in 1957 it fills in many blanks I missed due to being torn from my roots quite young. Hi Jane, my name is Kathleen Smith and Norah Galloway was my great aunt. My nana was Annie Galloway her older sister who died in 1991. My mum is Sally Brownhill and has been looking for any information regarding Nora as she has been trying to find her for the last few years. All my mum knew was that she had moved to England about 36/37 years ago and no-one heard from her after that. I would greatly appreciate if you could get in contact with me. I would also like to know about Nora, she married my uncle Alistair Macleod and they had one son Alan born about 1965. I have just found out that Norah, who was married to my uncle, Alistair Macleod, died in January 2006 in Preston. She had two sons, Allan born in 1965 and Alistair born in 1978. As far as I know he is living in Preston. Thats my Uncle Don 3rd right, back row, my mother was Kathleen MacKenzie nee Ross. Don Ross, known as Donty, lived next door to me on Outram Street. I knew them all. Elaine, take a look at picture #1072, you will see your mother there as a child. Cheers Harry I will have a look, have added a few pics via email of my Mam and Granda Ross, but have so much more unfortunately not on laptop, have got a cracking one of my uncle Don and my Granda at the back of Outram St and lots when there was naval landies with my aunt Elsie or Chrissie, will try suss how to put on, Thanks again.